Ingredients 2 cups + 2 teaspoons refined flour (maida) 2 teaspoons fresh yeast 2 teaspoons castor sugar 1 tablespoon chopped fresh mixed herbs 1½ tbsps finely chopped garlic 2 tablespoons butter + for brushing 1 tablespoon oil Milk for brushing Garlic powder for sprinkling Dried mixed herbs for sprinkling Method Put yeast in a bowl. Add castor sugar and 2 tablespoons warm water, mix well and set aside to activate. Sift flour in another bowl. Add garlic, fresh herbs and activated yeast and mix well. Add some water and knead. Add butter and knead to a soft dough. Cover with a damp muslin cloth and set aside to prove for 20 minutes. Preheat oven to 180°C. Knock back the dough, add oil, knead, shape into a loaf and transfer on a baking tray. Cover with a damp muslin cloth and set aside to prove for 20 minutes. 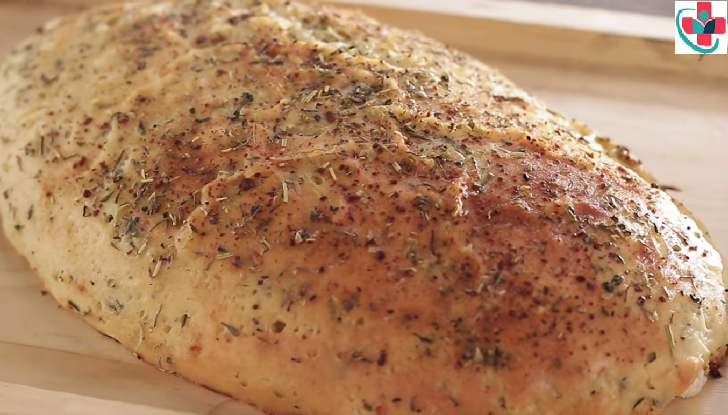 Brush some milk, sprinkle garlic powder and dried herbs on top of the bread. Put the tray in the preheated oven and bake for 15-20 minutes. Brush some butter on top and serve.